The risk, of course, with disability insurance underwriting, is the risk of disability. These are the three main components of disability insurance underwriting. In regards to your health, too many people think pre-existing conditions are covered by their policy. Generally speaking, they are not. If you had wrist problems, documented by a doctor, likely your wrist is excluded from coverage. The reason? Your wrist will likely lead to a disability claim. We will discuss disability insurance underwriting next so you understand how the process works. If you understand how the underwriting works for disability insurance, you will be better educated and informed come time for the application. Like any personal insurance (long-term care, life, supplemental health, etc), your health history matters. Unlike life insurance – and even long-term care – seemingly innocuous injuries or illnesses could have an effect. For example, that shoulder injury that laid you up for a couple months won’t affect your life insurance approval decision. However, the disability insurance carrier will likely exclude that shoulder and injury from coverage. Why? Because the injury prevented you from working. Moreover, there is the possibility of doing that again. Would you insure someone who you know has the high potential of disability shortly down the road? Your answer should be “no”. You would be fast out of business. Moreover, consider this: most disabilities are from illnesses rather than injuries. That is right. While we all want to insure our hands, and our hands are important to most of us to our career, the fact is a disability could be an illness like cancer, multiple sclerosis, or some other illness like diabetes. You also need awareness. If you have a pre-existing condition, chances are that condition will be reflected into the contract in some form or fashion. For example, if you have a history of depression, the carrier will likely exclude your condition from coverage. We receive too many angry responses from potential clients when we are upfront and honest about how their health condition affects the underwriting. The easiest way to get around this is to apply for a disability insurance policy NOW BEFORE these problems happen. If you can’t do that, we have other options that could help in the right situations, including guaranteed issue disability insurance. You might be thinking what this is. Well, nearly all of the insurance carriers in the United States pay money to fund a non-profit organization called the MIB. (It used to be called the Medical Information Bureau). The purpose of this organization is to ensure an accurate exchange of information. When this happens, insurance premiums are set correctly. Consumers enjoy an honest application process, knowing the premiums they are paying are truthful and based on an honest process. Think about what would happen if this wasn’t the case? Sick people would apply and pay very healthy rates. These sick people would file claims shortly thereafter. Really the only way the carrier to financially survive is to increase your premium. You wouldn’t want that. It isn’t fair to anyone. Moreover, it hurts everyone. The carrier will go belly-up, and no one would have insurance. This is why honesty is the best policy on the application. Additionally, this is why the MIB exists. It is important to note the MIB does not know your health history. In an easy explanation, what it does is it tracks your application history. Let’s say 5 years ago you apply for life insurance. You have high blood pressure. You note it on the life insurance application, and they issued the policy. Now you apply for disability insurance. However, you forgot to mention your high blood pressure. When the disability insurance carrier runs your “MIB history”, as they call it, the underwriter will see your life insurance application flagged. It really won’t give specific information, but offer general information that you have a condition related to the heart. If the underwriter sees a discrepancy, he or she will contact you for clarification. If it is severe, expect a rating or a decline. This might be obvious. Your occupation matters in disability insurance underwriting. An accountant has a less risky job than a construction laborer, right? Nearly all carriers classify your occupation from 1 to 5 (or 6) with 5/6 being the best. In other words, the higher the number, the lower the disability risk of your occupation. Moreover, the lower the disability risk…you got it, the lower the premium, all things being equal. That means if you are a skilled tradesman, you should still enroll in a policy, even if you have to pay a higher premium compared that of an accountant. Why? A disability can strike anytime. While occupational disabilities happen – and they happen all the time – they are not the #1 disability. As mentioned earlier, illnesses cause a majority of disabilities. Of course, your income matters. The higher you make, the higher your premium. The higher the carrier must insure. Is this a bad thing? No! Remember, we are insuring your income in case you can’t work due to a disability. If you don’t want to pay a high premium, you can always reduce your monthly benefit. For example, if your income allows you to have a $6,000 per month benefit, but you only want $3,000, then you can do that. The disadvantage is that, although you are paying a lower premium, you are potentially underinsured if you are disabled. Like your application history we discussed earlier, the carrier can see your prescription drug history. Temporary prescription drugs probably won’t matter in the application. For example, if you took an antibiotic 2 years ago, the carrier may want to know what that was for. However, it should not matter unless it is a serious drug. Your prescription drugs are not a secret. Disability insurance carriers rely on electronic data. Your prescription drug history is available through companies like Exam One. Think you can avoid it? No. Disability insurance underwriting includes your acceptance with the carrier reviewing your prescription drug history. How does this all work? Let’s go back to our high blood pressure example. You forgot to mention your high blood pressure on the disability insurance application. The underwriter sees the discrepancy and then researches your prescription drug history. She sees you are currently taking lisinopril. Next, she contacts you to find out more. FYI – you don’t want the underwriter to do any more work than he or she has to. Again, it is best for honesty with your agent and on the application. Depending on the frequency and degree of participation, the carrier will exclude your activity from the policy or decline your application altogether. In other words, if you like to rock climb, any disabling injury from rock climbing is not covered. Sounds good, John, you say. But, what if I join after the policy is issued. Good question. The carrier will likely cover any injuries; however, it will do a thorough investigation before doing that. It wants to see if you participated before the application and lied. Trust me; carriers have ways of finding out. If this is the case, the carrier will deny any disability benefit claim. Again, the moral of the story: be honest on your application. Could mean a lot of things. One lately, in particular, is the recreational use of marijuana. While many states have approved the use of recreational marijuana, it is not approved at the federal level. Knowing this, and the risk behind it, carriers usually consider marijuana use as tobacco (i.e. smoker status) and apply a rating, depending on the use. They will even decline your application for excessive use. Moreover, while in some cases, your application can go through non-medical underwriting, the carrier may require a urine sample to test your level of THC. Additionally, carriers will look up your credit and any bankruptcy history through lexisnexis. As stringent as disability insurance underwriting is, we have been able to help people with moderate to serious health conditions. We have helped people with bipolar depression, moderate anxiety, previous cancer diagnosis, and more. When you work with us, and you have a unique situation, we contact the underwriters directly and discuss your situation. We don’t give them your name or anything like that, so your personal information is safe. Well, you may be doing a disservice. Remember, who is behind this disability insurance? Well, it is you. And then your family, and then your life. If you are disabled, and can’t work, how will you pay your bills? Well, will you tap into retirement savings – and destroy your future? Will you sell your home – and destroy your future? Will you rack up debt – and destroy your future? Do you see what I am getting at? There is no good alternative, except for taking a modified or rated policy that will still pay a percentage of your income. The peace of mind is invaluable. Yes, there is John, you say. I will just invest! So, FYI I am a CFP and I know how hard it is for people to save. Be honest with yourself, will you? I doubt it. Even if you dedicated yourself, the amount is insurmountable. For example, let’s say you are eligible for $5,000 monthly benefit, 5 year benefit period. You make $90,000 per year. You are age 45. The premium is $132 per month. However, because of health conditions, the carrier rates you, and your premium is now $210 per month for the same $5,000 benefit. Is it a good deal? Absolutely! For everthing we discussed before. Let’s put some math behind it. In that 5 year benefit period, you are insuring up to $300,000 of income ($5,000 per month X 12 months X 5 years). That’s a lot. Think about how your life changes having that safety net. Do you know how long it will take to insure your income by investing? At $132 per month and a conservative 5% annual return (why would you put risk if you need this money), it will take you 47 years to save $300,000 at $132 per month!!! Do you think you will do better by saving $210 per month? It will take you only 38 years. And, what will you do if you are disabled in a year with no policy? Just for your knowledge, let’s say you are dedicated to saving $300,000 in 10 years as a disability fund. So ages 55 through your retirement age, you have some protection in case of disability. At a 5% annual return, you will need to save almost $2,000 per month! That is $24,000 per year and probably 1/3 of your take-home pay. Yikes! Let’s say you only have that $210 to save, well, you need an annual return (over 10 years) of 40% each year. That is just not going to happen unless you are extremely speculative with your money. The math doesn’t work. Taking a modified policy is the right choice. This is the reason why you need to take a modified policy. You don’t know when you will be disabled and it takes a very long time to save that money, if you even can. 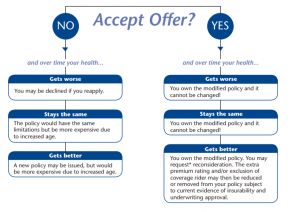 Here is a succinct illustration, courtesy from Illinois Mutual, which shows your options if you accept or do not accept a modified disability insurance policy. All points to accept. If you are declined for disability insurance or seeking other options, let us know. We have helped people with alternative options for disability insurance. Although these options are not ideal, they will provide some benefits in case you can’t work. We hope this article explained the disability insurance underwriting process better. 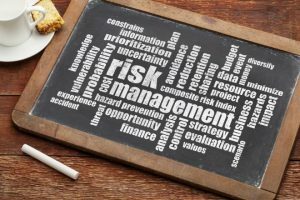 Although the underwriting is more stringent, there is nothing to worry about or fear. Now that you are aware of disability underwriting, are you ready to take the next step? Contact us or use the form below if you would like our assistance in helping you find the right disability insurance policy. As we mentioned earlier, we have helped many individuals, even those with health conditions, obtain important disability insurance. As with everything we do, we always have your best interests.